Pope Benedict XVI offered a nice reflection on his trip to France at his his Wednesday General Audience. I find interesting the Holy Father's discussion of the Cross and suffering -- specifically the sign of the cross by our Blessed Mother when appearing to St. Bernadette. Here is the english translation, by S+L's Alicia Ambrossio. Today’s meeting gives me a chance to go over some my recent pastoral visit to France, which culminated with my pilgrimage to Lourdes to mark the 150th anniversary of Mary’s apparitions to Saint Bernadette. I thank God fervently for the providential opportunity and acknowledge the Archbishop of Paris, the Bishop of Tarbes and Lourdes and all the people who worked with them to help my pilgrimage go well. I cordially thank the President of the Republic of France and the other authorities who welcomed me so courteously. The visit started in Paris where I met with all the people of France, paying respect to a beloved nation in which the Church has played a fundamental role since the second century. It is interesting that the need to distinguish Church and State, according to Jesus’ saying “Render unto Caesar that with is Caesar’s and to God that which is God’s” evolved within the context of this nation. Caesar’s image was imprinted on Roman coins, and so these belonged to him, but God, the Lord giver of Life, is imprinted on the human heart. Authentic laity does not mean ignoring the spiritual, but acknowledging that it guarantees our freedom and the autonomy of earthly reality, thanks to the dictates of creative knowledge which human conscience welcomes and acts on. It is with this perspective that I proposed in my reflection “The Origins of Western Theology & Its Roots in European Culture” which I delivered in a meeting with the world of Culture, in a place picked for its symbolism. That was the Collège des Bernardins, which the much missed Cardinal Jean-Marie Lustiger wanted to recognize as the heart of cultural dialogue. It is a twelfth century building, constructed for the Cistercians, where young people studied. In this building this monastic theology which gave birth to our western culture, is present. I started my speech with a reflection on monasticism, the scope of which was to seek God, quaerere Deum. When the ancient civilization was in crisis the monastics, guided by the light of faith, chose the master path, listening to the word of God. They were great cultivators of the Sacred Scriptures and their monasteries became schools of knowledge and schools of "dominici servitii", or service to the Lord as St. Benedict called them. The search for God, by its very nature, placed the monks in a culture of the word. Quaerere Deum, seek God. They searched for him in His word and thus had to constantly deepen their knowledge of His word. It was necessary to penetrate the secrets of the language, understand its structure. To search for God, revealed to us in the Sacred Scriptures, the sciences became important to deepen our understanding of the secrets of language. As a consequence monasteries became places of teaching, this allowed for the formation of a new culture. Because of this seeking God, walking on the road towards God, is still today the guiding path, the foundation of every true culture. Architecture is an artistic expression of the search for God, and without a doubt the Cathedral of Notre Dame in Paris is a valuable example of this. Inside that magnificent temple, where I had the great joy of presiding over the celebration of the Vespers of the Blessed Virgin, I implored the priests, deacons, religious, and seminarians from all over the country to give priority to the religious reading of the Divine Word, looking at Mary as a sublime model. On the altar of Notre Dame I greeted the great number of enthusiastic young people who were there. As they were about to begin a long prayer vigil I gave them two treasures of the Christian faith: the Holy Spirit and the Cross. The Spirit opens up the human intelligence so it can understand the beauty and truth of God’s love revealed in the Cross. A love from which nothing can ever take us away, a love that lives in giving it’s own life according to Christ’s example. Then I made a brief stop at the Institut de France, the home of the five national Academies. Being a member of one of these academies I was very happy to visit my colleagues. Then my visit culminated in the Eucharistic Celebration on Esplanade des Invalides. Using the words of the apostle Paul to the Corinthians, I invited the faithful of Paris and all of France to seek the Living God who shows us his true face in Jesus, present in the Eucharist, pushing us to love those around us the way he loved us. I then went to Lourdes and along with thousands of faithful, was able to experience the Jubilee Way which highlights the places of St. Bernadette’s life: the parish church with the baptismal font where she was baptized, “Cachot” where she lived in poverty through her childhood, the grotto of Massabeille where the Virgin appeared to her 18 times. That evening I participated in the traditional torchlight procession, a manifestation of faith in God and devotion to Our Mother. Lourdes is truly a place of light, of prayer, of hope and conversion, build on the rock of God’s love which was revealed on the glorious cross of Christ. As a happy coincidence, last Sunday was the feast of the Triumph of the Cross, sign of hope par excellence, because it is the ultimate witness of love. At Lourdes, the school of Mary, the first and perfect disciple of the cross, pilgrims learn to consider the crosses in their own lives in light of the glorious cross of Christ. Appearing to Bernadette in the grotto of Massabeille, the first thing Mary did was make the sign of the cross, in silence, without speaking. Bernadette imitated her, making the sign of the cross over herself with trembling hands. That was Mary’s way of initiating us into the central mystery of the essence of Christianity: the sign of the cross is the summit of our faith and making with an attentive heart we enter into the full mystery of our salvation. 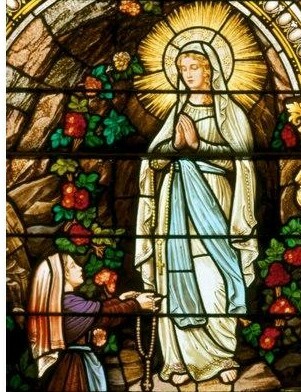 The message of Lourdes is contained in Mary’s one gesture! God loved us so much he gave himself for us: this is the message of the Cross, mystery of death and glory. The Cross reminds us that true love does not exist without suffering. Many learn that truth at Lourdes, which is a school in faith and hope and service to our brothers and sisters. The meeting with the French Episcopacy took place in this context: it was a moment of intense spiritual communion in which together we entrusted to the Virgin our pastoral hopes and worries. The next event was the Eucharistic procession with thousands of faithful, including as always, many who are sick. Infront of the Blessed Sacrament our spiritual communion with Mary was intensified and deeped because She gives us eyes and a heart capable of contemplating her divine Son in the Holy Eucharist. The silence of these thousands of people before the Blessed Sacrament was moving, it was not an empty silence, but a silence full of prayer and recognition of the presence of the Lord who loved us enough to get on the cross for us. Monday the 15th of September was the liturgical feast of Our Lady of Sorrows and was dedicated in a special way to all those who are sick. After, a brief visit to the chapel of the hospital where Bernadette received her first Communion. On the altar of the Basilica dedicated to the Holy Rosary I celebrated Mass and anointed the many sick who were present. With the infirm and those who take care of them I wanted to meditate on the tears of Mary, poured out at the foot of the cross, and her beautiful smile which illuminates Easter morning. Dear brothers and sisters, together let’s thank God for this apostolic voyage, rich in spiritual fruits. In particular let us thank Him because Mary, in appearing to Saint Bernadette, opened up to the world a sacred space in which to encounter the divine love that heals and saves. At Lourdes, the Blessed Virgin invites us to consider this earth a place of pilgrimage towards our homeland, heaven. In reality we are all pilgrims and we need the Mother who guides us; at Lourdes her smile invites us to keep moving forward with great faith in the knowledge that God is good. God is Love. Pope Benedict XVI, Wednesday General Audience, September 17th 2008.